Through Restorative Dentistry, our dentist fixes or “restores” teeth that has been damaged by cavities. 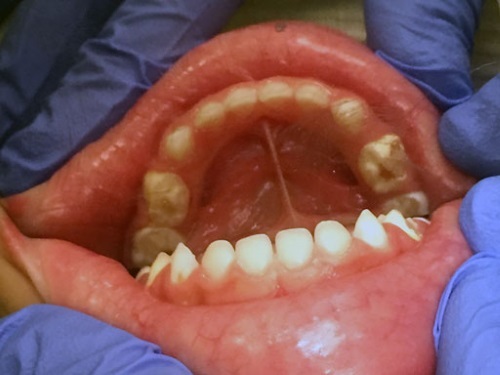 Sometimes this can be accomplished without drilling, as is the case when the cavity has not yet broken through the outermost layer of the tooth. Doing so requires excellent oral hygiene and fluoride applications. When a cavity “rots” away too much of the tooth to hold a filling, the dentist may place a crown on the tooth. If a tooth is hurting because of a cavity or the decay is too close to the nerve, an endodontic (meaning inside the tooth) procedure or removal of the tooth may be necessary. More specific information about dentistry for kids can be found below. The hardest substance in the human body is enamel. Enamel is the outermost layer of the tooth and gives our teeth their characteristic pearly white look. Enamel is a crystalline structure called hydroxyapatite — a mixture of calcium and phosphate. Although enamel is very hard, it is susceptible to strong acids that can melt away its hardness. Primary or “baby teeth” have an even thinner outermost layer compared with adult teeth, which makes their teeth less resistant to cavities. As mentioned earlier, our dentist may not need to drill on small cavities that stay in the outermost layer of the tooth. This process is called remineralization. During remineralization, the tooth heals the outermost layer by using calcium in the saliva to repair the partially “melted” enamel. In order for this to happen, the teeth must remain clean so that the tooth can heal faster than the cavity can grow. This tooth healing process is very slow. Fortunately, Coastal Pediatric Dental & Anesthesia can help stop tooth decay by using fluoride. Fluoride acts as a “tooth vitamin,” healing the tooth faster and making the tooth’s exterior stronger. Many dental patients, kids and adults alike, don’t mind dental procedures except for the “drilling” part of treatment. Dentists completely agree with you on that. However, without proper preparation or “drilling,” the filling will not stay in the tooth and the cavity would get bigger. If the cavity is not removed and the healthy tooth structure is exposed, the filling material cannot stick to the tooth. In addition, dental cavities (also called caries) is an infectious disease. The dentist needs to remove the infected tooth structure to prevent the cavity from spreading deeper into the tooth or onto a neighboring one. That is why in dentistry for kids, and for adults too, the dentist has to prepare the tooth in order to restore it. After the tooth has been prepared to free it of infection and decay, the dentist can now restore the tooth to its former glory by placing in a filling. Fillings fill the hole left by the cavity (cavity just means hole). There are numerous types of dental restorative materials, but two are most common: white and silver fillings. White fillings consist of a plastic resin material and include dental composites and glass ionomers. These fillings have various filler materials placed in them to give the filling different properties that are desirable for different types of restorations. One such example is the use of barium to make the filling show up on dental x-rays. White fillings must bond to the tooth with adhesive and chemical bonds, which makes them very susceptible to contamination from saliva and/or recurrent decay. Cooperation during the procedure and great aftercare are therefore a MUST if you want white fillings to last. Most patients will greatly appreciate the natural appearance of their newly filled tooth. Amalgam is a metal alloy consisting of silver, tin, and copper. For centuries, dentists used amalgam because of its durability, affordability, and ability to prevent leaking from where the filling meets the tooth. During placement, amalgam fillings are much less sensitive to contamination than are white fillings. However, the restored tooth appears silver rather than natural. In addition, the preparation phase of the procedure often requires that mechanical forms of retention be placed into the tooth. This may require more preparation of the tooth. Crowns are full-coverage restoration for the tooth. When a tooth has a severe cavity or multiple cavities on its surfaces, the tooth will likely need a crown as opposed to a filling. The reason for this is because fillings require sufficient healthy tooth structures for the filling to go into the tooth. On the other hand, a crown will surround the remaining healthy tooth like a suit of armor. It is important to understand that crowns are very different in pediatric dentistry as compared to adult dentistry. In adults, the dentist takes an impression of the prepared tooth, then a lab or mill custom-fabricates the crown out of precious metals and/or porcelain. The process is time-intensive and expensive, but is meant to last the lifetime of the permanent tooth. For kids, the crown is pre-made of plastic, composite, or stainless steel. The crown can then be placed on the same day it is prepared. At Coastal Pediatric Dental & Anesthesia, we make every effort to give your child the most esthetic (natural) appearance to their front teeth. This is done by using white-colored crowns or white-veneered stainless steel crowns on the front teeth whenever possible. These tooth-colored crowns often need to be thicker than the natural teeth to achieve the strength needed to prevent the materials from breaking when biting down. 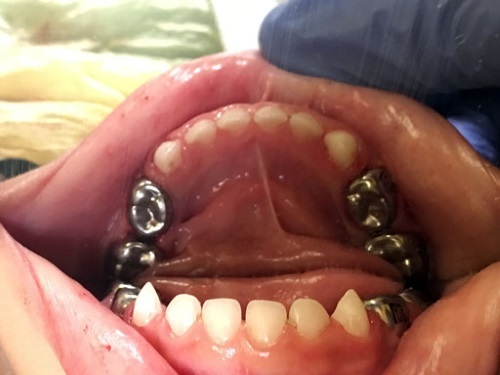 In addition, there is often a balancing act of achieving good esthetics and durability when dealing with anterior crowns for children. Stainless steel crowns are typically the best option for damaged posterior primary (baby) teeth. This is because of the strength and durability of stainless steel despite its thinness. Some parents request white crowns, however, physics and tooth anatomy explains why they are seldom effective. As discussed above, primary teeth are small and have a thin outermost layer when compared to adult teeth. When we bite down, the load of the poster teeth is heavier than that of the front teeth. For example, when you try to cut a thick piece of cardboard with scissors or crack a nut with a nutcracker, you use the portion closest to the hinge because it creates more force. Back teeth do the same thing, and that’s why we chew our food with them. This force can break the thin, white-colored crown if it is placed on the back teeth.